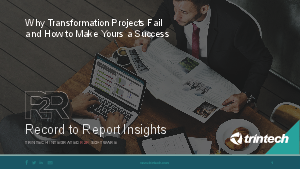 The primary objective of any financial transformation project is to achieve process improvements by improving the quality, effectiveness and efficiency of financial information, ultimately enhancing shareholder value. Take the example of the close process. It would be incredibly simple to shorten the process by adding more people, however, is this an efficient way to reduce the number of days to close? On the right, the Hackett Group displays that best in class companies actually can be seen closing in fewer days, with greater automation and significant lower audit fees, emphasizing the idea that you really can do more with less.